Justin Timberlake is returning to the Super Bowl stage for the first time since Janet Jackson's notorious "wardrobe malfunction." 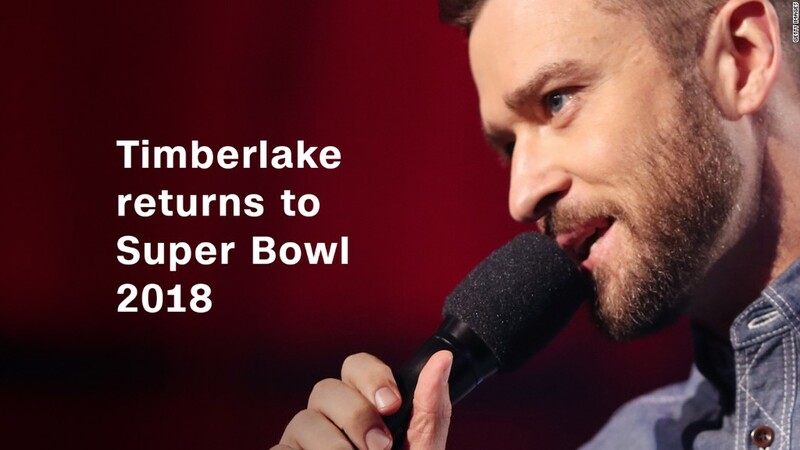 The NFL announced Sunday that Timberlake, 36, is set to perform in Super Bowl LII's halftime show on Feb. 4 in Minneapolis. The last time he graced the game's halftime stage was at Super Bowl XXXVIII in 2004. During the show, Timberlake ripped away part of Jackson's costume, exposing one of her breasts to a TV audience estimated at roughly 140 million. Jackson's spokesman said it was a costume reveal gone wrong, but critics questioned whether it was really accidental, sparking a controversy dubbed "Nipplegate." Timberlake apologized for the incident and said it was "not intentional and is regrettable." Jackson suffered criticism about it for years. It will be Timberlake's third time performing at the game. He previously appeared at Super Bowl XXXV in 2001 with his band *NSYNC. It's unclear whether anyone will be joining him on stage this time around. In February of this year, Lady Gaga performed during the game's halftime show.